Dr. Katherine Bowers and co-editors Dr. Connor Doak (University of Bristol) and Dr. Kate Holland (University of Toronto) have published a volume called A Dostoevskii Companion: Texts and Contexts. The powerful, impassioned, and often frenetic prose of Fedor Dostoevskii continues to fascinate readers in the twenty-first century, even though we are far removed from Dostoevskii’s Russia. 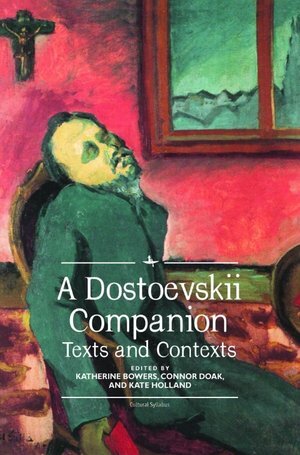 A Dostoevskii Companion: Texts and Contexts aims to help students and readers navigate the writer’s fiction and his world, to better understand the cultural and sociopolitical milieu in which Dostoevskii lived and wrote. Rather than offer a single definitive view of the author, the book contains a collection of documents from Dostoevskii’s own time (excerpts from his letters, his journalism, and what his contemporaries wrote about him), as well as extracts from the major critical studies of Dostoevskii from the contemporary academy. The volume equips readers with a deeper understanding of Dostoevskii’s world and his writing, offering new paths and directions for interpreting his writing. For more details, click here.